I had to work this New Year's Eve. That is a mixed bag. On one hand I have to work but on the other hand it means that Jen has to do 100% of the cooking. While I enjoy cooking it's nice to get the occasional night off. When I returned home Jen was watching something on television that had Gary Sinise and Claire Forlani in it. I immediately stumbled outside and ran to the town common, reached in the trash and pulled out today's newspaper. It said December 31, 2010. Phew. I could have sworn I'd slipped backward in time to 1996. For a moment I was scared that I'd turn on the radio and have to hear a Bush song again. 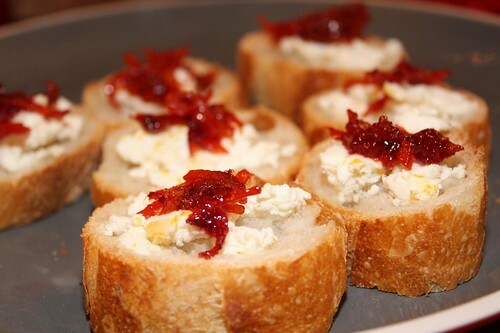 Jen started off by making this crostini with goat cheese and blood orange marmalade. Jen opened a bottle of champagne only to find out that it was actually kind of gross. I'm not sure where it came from. It looked like a nice bottle, it was actual champagne, made in France, but it just tasted like disappointment. So, instead of the traditional bubbly for the holiday I made some Old Fashioneds. Is that how you pluralize Old Fashioned? 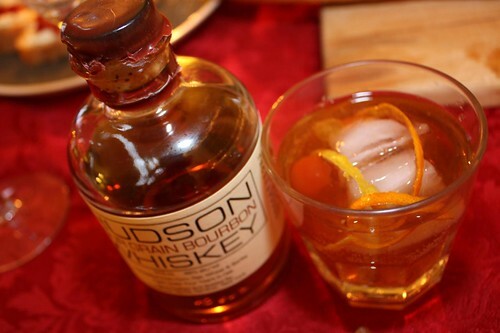 I used the Bourbon I'd purchased this summer at Tuthilltown Spirits along with some local artisanal homemade seltzer water (meaning that Jen made it with our tap water in her Sodastream). 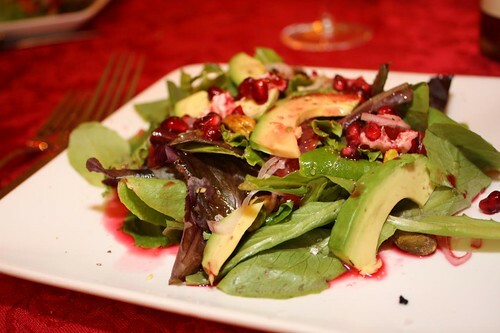 For salad Jen made a blood orange and grapefruit vinaigrette and served it with mixed greens, avocado, sliced shallot, and pistachios. 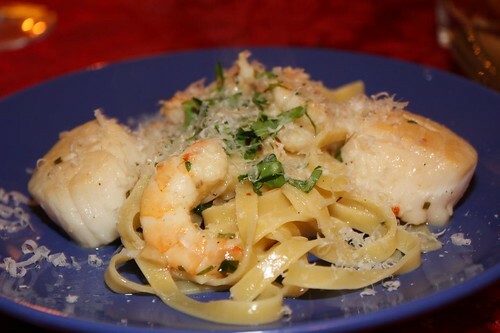 The pasta was tagliatelle with scallops and shrimp in a champagne beurre blanc. She asked me if she could use beurre blanc as a pasta sauce. I told her it was untraditional but worth a try. It ended up working really well even if it did cause a great deal of anxiety for her as she prepared it. 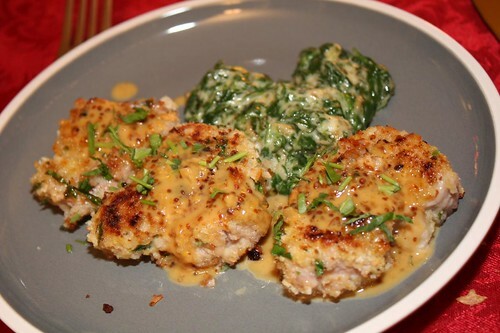 The final course was breaded pork loin medallions with a mustard cream sauce and creamed spinach. Apparently this was Berkshire pork from our local butcher. It was quite tasty and the mustard sauce is similar to a recipe I used to make quite frequently at one of the restaurants I worked at. Sadly we had to watch some of the [INSERT NAME HERE] New Year's Eve Bash which was pretty dreadful and had to expose me to a bunch of terrible performers, bands, and celebrities I'd never heard of before. Also we got to hear the host brag about how the next seven minutes were commercial free. An entire seven minutes with no commercials! Brought to you by Nicorette Gum and some cell phone company whose name I forget. Luckily I have 364 days to forget about all of that. Happy New Year! It has been pointed out that I have made some inaccuracies in my descriptions. Such is the risk of writing about that which you have not made.